I always thought the word “fruitarian” was like the word “chocoholic”—a cutesy term used to describe someone’s food preferences but not actually a real way of life. That is until I became a vegan. A couple years ago, I was inspired to convert to a plant-based diet by a community of vegan vloggers I discovered on YouTube. The more I became educated about veganism, the more invested and curious I became about the inner culture of the lifestyle. Soon I learned that there isn’t just one way to be a vegan: There are dozens. According to certified holistic nutritionist Kelly LeVeque, the fruitarian diet is “a subset of raw veganism, where you eat botanical fruits in their natural state.” This includes all sweet fruits and seeded fruits (such as avocado, tomato, cucumber, and olives), as well as nuts and seeds. No grains, no cooked food, certainly no processed food. The strictest of fruitarians don’t even eat vegetables or starches… literally just fruit. At first, I was horrified, and then I was fascinated—enough to want to give the diet a try myself. One of the most prominent fruitarian spokespeople is a YouTuber who goes by Freelee the Banana Girl. To all of her 670,000 subscribers, Freelee preaches the benefits of a fruit-heavy lifestyle, downing 30 (sometimes 50!) bananas in a single day. (Watching her do this on camera is oddly gripping.) Freelee’s view is that eating low-calorie fruits in large quantities delivers maximum glucose to the brain, fueling her mind and body while keeping it slim. From the looks of her washboard abs and fiery demeanor, she seems to be on a constant sugar high. Personally, I’m not looking to lose weight. But the idea of getting to stuff your face and wake up with a flat tummy enticed me. Plus, even though I was already vegan when I discovered fruitarianism, my diet featured more processed junk and fewer fresh foods than it really should have. If nothing else, I figured a bout of fruitarianism could help me get into the habit of eating more raw fruits and veggies. Breakfast: A big smoothie with three bananas, blueberries, dates, and about a cup of coconut milk. As strange as it sounds, hunger was not the issue. This diet has nothing to do with portion control. You’re encouraged to eat as many fruits, nuts, and seeds as you desire. Polishing off those two bowls of fruit for lunch was shockingly difficult. Calorie-wise, I could have eaten the equivalent in tacos or pizza and still be starving. But the calorie density of these foods is so low that you can fill your stomach to the brim without actually overeating. Of course, downing raw fruit all day isn’t exactly exciting, but at least it doesn’t leave you hungry. It does, however, encourage frequent bathroom breaks. Fruit is packed with fiber and water, two substances that seem to slip and slide right through the digestive system. All day, I could feel every twist of my intestines churning and bubbling to digest the food. Needless to say, this wasn’t comfortable. But sure enough, I woke up the morning of day two completely cleared out. My belly was astoundingly flat, and this was after a single day. With results like that, I had just one thought: Bring on the fruit! Incidentally, the fruitarian literature doesn’t say much about alcohol. But I figured if I couldn’t even have broccoli, booze was probably off the table too. Like many other restrictive diets, fruitarianism isn’t conducive to social gatherings. Just imagine showing up to a restaurant with friends and asking for a crate of bananas. By the time the cocktail party rolled around, my fruitarian enthusiasm was dwindling. I wanted to enjoy myself at the event (one vodka soda wouldn’t kill me, would it?). Plus, I was starting to get decidedly non-fruitarian cravings. Interestingly, these food hankerings weren’t for a big home-cooked meal or a fatty dessert. All I wanted was some kind of starch. Potatoes, maybe, or rice. Or pasta. Or bread. Just something a little more substantial to break up the sugary fruit. For the remainder of my five-day experiment, I continued to stick to the 75% rule. For breakfast, lunch, and snacks, I’d reach for my tummy-flattening fruit. But dinner time would arrive, and I’d buckle. I’d desperately crave a starch. I suppose I could have suppressed these cravings, but I’m not keen on torturing myself. So instead, I whipped up a nightly plate of pasta or baked potatoes, and that seemed to hit the spot. That said, I would not recommend following a 100% fruitarian diet all the time. And neither would most health experts. 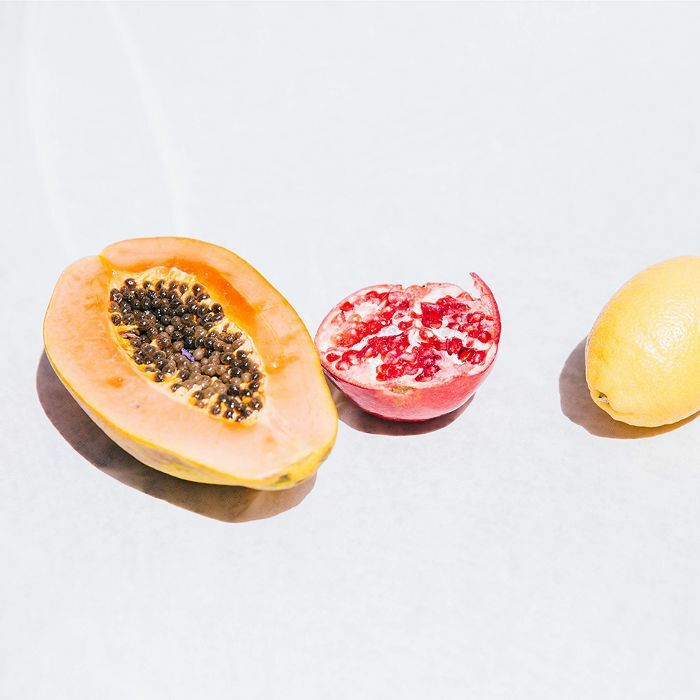 Certified nutritionist Dana James says that even though fruitarianism is better than the standard American diet, which is packed with hyper-processed foods, it’s still far from ideal. In the long run, the diet’s drawbacks are significant. “The sugar from the excessive amount of fruit destabilizes blood sugar levels, which can lead to lethargy, cravings, lack of concentration, a disrupted microbiome, and more,” she says. Plus, it’s impossible to get complete nutrition from fruit alone. “You’ll need to supplement with protein powders, B complex, omega-3, iron, zinc, vitamin D, and iron,” James advises. On that note, see what happens to your body when you give up alcohol.